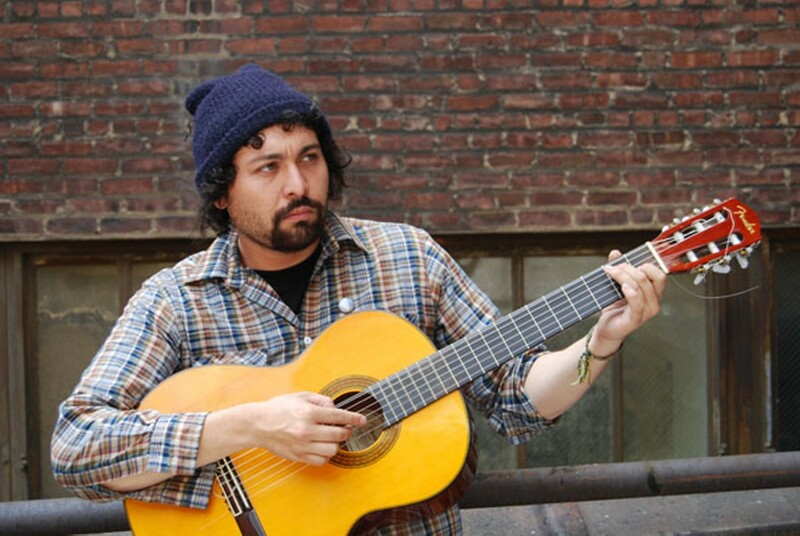 Local folksinger Roberto Miguel sings of politics, introspection, and hometown pride. Miguel Reyes plays on Thursday, July 30, at Fiveten Studio (831 Broadway, Oakland) with Shayne Keator, Greg Ashley, Joseph Bryce, and Mason Lindahl. 7 p.m., $5-$10 donation. No one turned away for lack of funds. A few years back, Blender published an article on the 25 greatest songs about Los Angeles, which included short, snarky explanations on what was "the most L.A. thing" about each band. Apparently, any connection to drugs, movies, or hot girls meant a song is about LA. "Welcome to the Jungle" took the number-one spot, and Fleetwood Mac's "Gold Dust Woman" came in at number ten. So what makes Fleetwood Mac songwriter and singer Stevie Nicks "so L.A.?" According to Blender, "inquiring after the most LA thing about Nicks is like asking, 'What's the most Egyptian thing about Cleopatra?'" Since Nicks was born in Phoenix and started her career in the Bay Area, the line was cute but not particularly apt. But it's a perfect way to describe what Miguel Reyes is for Oakland. Prior to his latest release, After Dancing, Reyes simply went by the moniker "Miguel from Oakland" (a nickname he was given while on tour). He says he feels deeply rooted in his hometown, where he was also born (he has spent his entire life in various East Bay cities). He first became involved in music under the tutelage of famed local anti-violence activist Andres Soto, who taught Reyes how to play the clarinet when he was in fourth grade. Interested in playing jazz, he later learned trombone, and says he benefited greatly from local programs like the San Pablo-based Los Cenzontles Mexican Arts Center and the East Bay Center for the Performing Arts. Later, his involvement in the local slam poetry scene taught him about performance and lyrics (Reyes performed with Tourettes Without Regrets and eventually made it to the national championships.) He cites Bay Area hip-hop, funk, and punk as major musical influences, though you'd have to listen closely for that in his all-acoustic folk sound. Too often treated as the scrappy little sister of its more glamorous across-the-bay counterpart, Oakland gets a bit of overdue affection in After Dancing, which celebrates its release on Thursday, July 30, at the Fiveten Studio in Jack London Square. The song "Wildchild" is a sweet and self-deprecating confession of homesickness: I'm on the road now which means I'm all alone now / if I don't sleep alone it's because I play a guitar. Over the past few years, Reyes has toured extensively through the United States, Europe, and Mexico, both as a solo artist and as a trombone player for UK ska punk band Citizen Fish and New York's Leftöver Crack. Though he sings that he had fun down in Miami, New Orleans, Chicago, too during tours, and considers New York a second home, Reyes promises Oakland, California, coming right back home to you. While sleeping in New York, he mistakes the subway for an earthquake during a dream about California, then wakes up next to a stranger to realize I was alone. As meaningless as it's become to compare any folksinger to Dylan, it's hard to resist comparing Reyes' sound to some of the less heavy songs from mid-1960s albums like Another Side of Bob Dylan, in music as well as the self-conscious lyrics. Reyes finally concludes that although he had considered himself a wild child, born and bred to run, the more I run, I realize I've never really gone. Written and recorded over the course of two years, After Dancing follows Reyes' 2007 debut, Stairwells, which was recorded by local artist Winston Goertz-Giffen in the stairwell of his home. Comparatively, Reyes says that After Dancing is "a lot more personal, and in some ways more honest" than his earlier work. It was mixed, mastered, and recorded by Reyes' brother Monte, and features art by local artist and poet Zack Houston. All tracks are currently available for free on Reyes' web site, RobertoMiguel.org. He has eventual plans to re-record the entire album with additional instrumentation. The title, says Reyes, indicates a move from more upbeat music toward more political, introspective songwriting. "I feel like I came out of the punk community, and most of the folk that comes out of the punk community is really energetic and dancey," he says. "It's awesome and I've made a lot of music like that. But I feel like this is more of a self-inventory, and more intimate than other stuff I've done." The eight songs are a split between sociopolitical statements and more personal, introspective stories of love and heartbreak. Opening track "Seasons" has the most interesting guitar playing, and some great lines about a doomed relationship (Our love is like a city, dear, polluting the air and the sea), while "Border" talks about immigration. The most "Oakland" of the songs, though, the one that will hit number one when Blender writes an article about us, is "Gunshots." It was written after Reyes heard gunshots one night from his then-home in North Oakland, around 53rd and San Pablo. The song begins: I heard gunshots last night/semi-automatic echoes in the dark/And I wonder who they put to sleep/Were they cold like me? Reyes goes on to wonder about the victim and associates the shots with the same one that killed his uncle, John Edejer, in San Pablo more than a decade ago. "My uncle was murdered when I was 17 years old. He was 36 at the time," Reyes explains. He saw firsthand how the impact of a single person's death spreads so widely, beyond the victim himself to family, friends, and the community as a whole. "That was the first time that I started drinking and using drugs to escape from reality, consciously," admits Reyes, who adds that he has now been straight-edge for about five years. "And I just saw how it affected my family around me. I saw how far it goes beyond a murder, what a huge impact it makes. ... It's catastrophic in so many different ways." But despite the violence that continues to plague the East Bay and the tragic loss his family experienced firsthand, Reyes still shows affection and optimism for his hometown: This city is a paradise to me/to others this city is a cell/This city can be a beautiful dream/and I was awakened by a gun. He associates the problem of violence in Oakland to gentrification in some ways, pointing out how an influx of new people can damage the original community. "I feel really at home in Oakland, but that there is a huge transient culture that comes in and changes the neighborhood. If you move to a neighborhood that people with money want to be in, then it eventually becomes a neighborhood that you can't afford," he says. "It's something that's not fair to the community but it's also something that I don't know how to stop. And I know in some ways it's also something I'm part of." The band's unabashedly weird performance at Fox may have pleased die-hard fans, but it didn't convert the uninitiated. An enthusiastic crowd and creative interpretations of its songs made the Brooklyn band's show at The Fox Theater a success.